Apr. 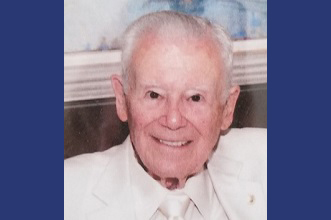 3, 2019: Eleanor Colson Curtis van Hoogstraten, age 92, a longtime resident of Bronxville and its environs, died on March 11 at Calvary Hospital in the Bronx, where she had been in hospice care. Ellie, as she was always called, was born in New York City on November 18, 1926. Her parents were Mary Helen (Seelbach) and Edward Gilman Curtis. She had two older sisters, Mary Gilman (Gil) and Anne. In 1927, her parents moved the family to Bronxville, where they had bought a new house at the corner of Woodland and Greenfield Avenues. A brother, Edward M. Curtis, was born in Bronxville at Lawrence Hospital in 1930. 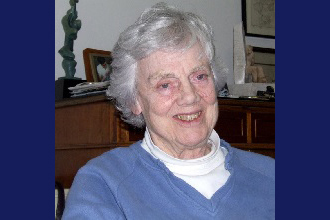 Ellie attended the Bronxville School through the ninth grade and was then a boarding student at the Madeira School in McLean, Virginia, from which she graduated in 1944. In 1948, she graduated from Wellesley College with a degree in art history, but her true love was in creating art and she continued her studies at the Art Students League of New York. Then Macmillan Publishers hired her to illustrate a line of books for older children and young adults. During the 1970s, Ellie taught art at the Bronxville School and gave private lessons in painting and sculpting. She was also an excellent potter and jewelry maker who frequently exhibited and sold her work. Ellie was a natural athlete. At the age of ten, she was diving off the high board doing jackknives or double twists or backflips. She also loved ice skating and in future years became a certified skating judge. She was particularly fond of ice dancing, and at the age of 60 she won an ice-dancing contest with a 16-year-old boy as her partner. Ellie also enjoyed singing. She was an alto who could sight-read and was a volunteer in several amateur theatricals both at home and abroad. In the years following the Second World War, many young Americans headed to Europe to help address the refugee and displaced person crisis of the time. Ellie volunteered at Church World Service and was sent to Munich, Germany. She also worked with the Tolstoy Foundation. While in Munich, she met her husband of 58 years, Jan van Hoogstraten of The Netherlands. They were married at his family home on the 4th of July, 1953, and moved first to New York City and then to Fleetwood, New York, in 1956. They moved to Bronxville in 1966. In 1980, she accompanied her husband back to Germany, where he served as chief of mission of the International Organization for Migration. They lived in Bonn for almost seven years. Upon their return to the United States, they settled into an 18th-century house in Thompson, Connecticut, which was their home for over twenty years. Ellie is survived by her son David of Washington, D.C. and his wife, Michelle Kayon, and their children, Daniel and Julia, and by her son Nicholas of Hastings-on-Hudson and his wife, Sarah Brockus, and their children, Anya and Naomi. She is also survived by her sister, Anne Fredericks, and her children, Maria, and William and his wife, Ivy, and their children, Charlotte and Thomas Fredericks. She is also survived by many other relatives in the United States, The Netherlands, and Brazil. On Saturday, May 4, at 11:00 am at the Kensico Cemetery in Valhalla, New York, Ellie’s family will observe a graveside memorial service. All friends are welcome to attend.